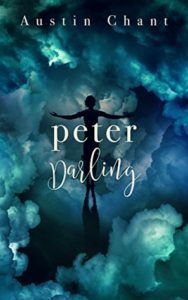 I received a copy of Peter Darling, by Austin Chant, from Netgalley. Ten years ago, Peter Pan left Neverland to grow up, leaving behind his adolescent dreams of boyhood and resigning himself to life as Wendy Darling. Growing up, however, has only made him realize how inescapable his identity as a man is. But when he returns to Neverland, everything has changed: the Lost Boys have become men, and the war games they once played are now real and deadly. Even more shocking is the attraction Peter never knew he could feel for his old rival, Captain Hook—and the realization that he no longer knows which of them is the real villain. Oh, how utterly marvelous! I have to be honest, I’m not generally a fan of retellings; I just so rarely read one I think improves on the original. Peter Darling looked more like a sequel than a retelling though, so I decided to take a chance and read it. I am so glad I did. I loved almost everything about this. I thought Pan and Hook were charming, and Peter and James even more so. I liked how it makes the reader think about the nature of growing up, how you can never really go back, identity, longing, love and loss. The writing is on point and it’s well edited. Personally, I had a little trouble with Peter and Wendy being the same individual, as they are quite distinct in the original Peter Pan. However, the way Barrie conflated wife/mother in the original Wendy is one of my strongest and most uncomfortable memories of that book. So, this merging of characters might not be so difficult for other readers. It’s certainly creative and wonderfully done. I would love to see Ernest get a book, since I curious how his life will turn out. All in all, Chant has just made my radar. I’ll be looking for more. This entry was posted in books/book review and tagged #DiverseRomanceBingo, #ReadDiverse2017, 5*, book review, fantasy, M/M on February 28, 2017 by Sadie. 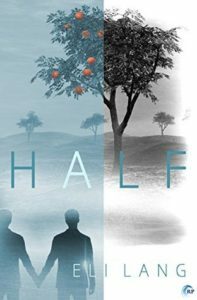 I received a copy of Eli Lang‘s Half from Netgalley. Oh man, what to say about Half? It’s absolutely, devastatingly, hauntingly beautiful. The writing and language in this book is amazingly poignant. The characters are similarly lovely. The dilemma the main character finds himself in, the decision he has to make and the effect it will have on the people he loves is a gripping one. And that final decision was the harder, certainly literarily rarer one and I appreciated that. I think it’s one disabled readers should get to see more often. However, it’s basically insta-love, leading to insta-relationship, there isn’t a lot to the plot considering how long the book is, and a lot seems to hinge on decisions of the past. It’s also very slow. Slow in a contemplative way, not a boring way, but it’s certainly not action packed. In a very real way I kind of felt like all the lush language got in the way of telling the story. It’s evocative, but tended to stall the forward movement. I do look forward to more of Lang’s writing though. This entry was posted in books/book review and tagged #DiverseRomanceBingo, #ReadDiverse2017, book review, Fae, fantasy, M/M, romance on February 26, 2017 by Sadie. 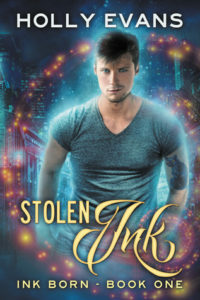 I received a copy of Holly Evans‘ Stolen Ink from Netgalley. I’m Dacian, a tattoo magician, and my life went from my biggest concern being finding a pretty guy to fall into bed with at the end of the week to everything falling apart around me. There are two problems in my life. I was seriously disappointed in this book. There is such a cool idea here. The connection between characters and their tattoo/companion animals is really interesting. Unfortunately the author did not pull it all together in a complete, engaging story. The biggest problem is the writing. Sure, it’s readable and the dialogue isn’t such that it feels amateurish, it’s even pretty, but it all feels very shallow, like the reader is only given access to the surface of a much deeper story. I felt cheated. For a long time, after starting the book, I thought this must be a latter book in a series, because I wasn’t sure what was going and the characters seem to have so much history that we’re not given. Further, so much of the writing is tell, instead of show. I just never felt connected or invested in anything or anyone. Then it climaxes suddenly and is over. I was left with some really basic unanswered questions, like what was the fundamental difference between and Ink and Tattoo Magician? Why did being an Ink magician need to be hidden from the council. Why was the council so scary and useless? What were the tattoo animals if not spirit animals, which they weren’t as a spirit animal is something different? And if it’s the bearer’s, say, soul, which it is kind of inferred they may be, how can they have more than one? It all led to a deep feeling of dissatisfaction. I didn’t hate it. In fact, I really wanted to like it because I liked the idea of it. I’d probably be willing to give the author another shot, but this one was a bust for me. Oh, and the cover doesn’t match the dark tone of the book or main character at all. This entry was posted in books/book review and tagged book review, fantasy, M/M, magic on February 25, 2017 by Sadie.